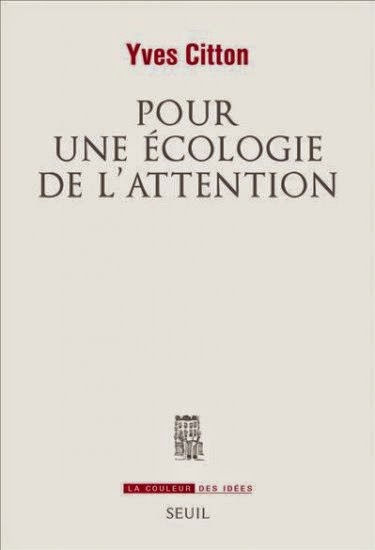 Yves Citton's Pour une Écologie de l'Attention is something of a companion volume to L’Économie de l’attention. Nouvel horizon du capitalisme? a book edited by Citton. Many of the essays in the latter cite the former. However, the different titles, and the question mark in the latter suggest a divergence around a central question. Both books work from the central provocation that we are living through a profound mutation in the nature of attention, never have we had so many distractions or devices soliciting our attention. What remains in question is first whether or not this transformation is best of all understood as a new economy of attention? Terms such as "paying," "cost," and "investment" regularly suggest themselves when it comes to discussing attention. Attention appears as a scarce resource and it is quite easy to speak of losses and gains when it comes to attention, as every moment spent reading tweets is not spent reading books. The more important question is whether or not attention can be understood as an economy of sorts, but whether we have entered a new phase of capitalism in which attention itself is productive of value. Metaphor meets mode of production. Citton's answer to the first question in this book is to propose a different way to conceptualize attention, as an ecology rather than economy. In doing so Citton follows thinkers such as Gregory Bateson, Félix Guattari, and Spinoza (especially as the latter has been read by Hasana Sharp) in which thinking itself is understood as an activity dependent on other conditions and relations. To posit an ecology of thought, or of attention, is to cease to see it as a "kingdom within a kingdom" and instead to see it as situated within its constitutive conditions. Positing attention as a ecological matter, as dependent a changing environment of conditions and relations, escapes the individualistic bias underlying positing attention as a fixed resource and investment. Such individualist accounts vacillate between neoliberal dogma, "invest in your attention capacity," and moralizing nostalgia, "pay attention to the world around you." They consider it a given that attention is a faculty, something that individual's possess, rather than a relation that is produced. Citton argues that attention must be understood as transindividual. Attention is transindividual not just in the sense that what I pay attention to is also what others pay attention to, but that I often pay attention to another's attention. Sometimes I pay attention to a collective and anonymous subject of attention, the "trending topics" of various social media sites, at other times I focus on the specific attention of another person, following the point of view of a writer, a camera, or the curator of an exhibit. Attention is always the attention of, and with others, but sometimes these others pass invisibly beneath our notification, structuring what we see, at other points it becomes the explicit focus of our attention, calling into question what we see or do not see. The different modes of transindividuality underscore the fact that an ecology of attention is then based on the diversity of forms and types of attention. Far from seeing attention as something which is always already uniform, capable of being spent or invested, wasted or saved, there are diverse mode of paying attention. We read and watch different formats, different forms of media, differently, skimming tweets and getting lost in a novel. 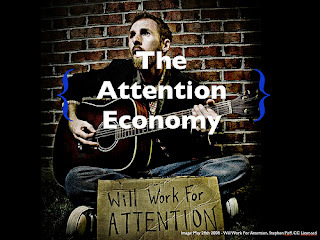 Thinking in terms of an ecology of attention displaces the individualistic basis of the economy as metaphor, but how does an "ecology of attention" make it possible to make sense of the intersection between attention and contemporary capitalism? How does such an ecological focus address the idea of an attention economy? Citton considers multiple perspectives on an economics of attention, from a more or less neo-classical one in which attention is placed at the center of a reversal in the status of scarcity. It used to be the goods, resources, were scarce; now it is attention itself that has become scarce as a finitude of time and focus confronts an unimaginable plethora of things to read and watch. (Of course this applies only to things available online, and to those who have access to them. Market based scarcity still applies to the physical world, 3-D printers notwithstanding). Citton also considers the perspective developed by Tarde (and returned to by Lazzarato) in which attention drives consumer society, desire must be produced and reproduced. For an attention economy to be anything other than a figure of speech, a metaphor of sorts, attention must be both quantifiable and capable of being accumulated. The first is the work of various apparatuses of capture that monitor and record clicks and attention rendering the different glances and searches quantifiable. There are limits to this quantification making it difficult to speak of anything like "abstract attention." While capital is utterly indifferent to the individual underlying labor power, buying their time and not their personality, who is paying attention matters very much to those who track it. As Deleuze argued the subject of attention is neither an individual or a collective but dividual, a constant bifurcation into different classes and classifications---Males age 18-35, individuals earning between $35,000 and $45, 000 dollars a year, etc. The difficulties of quantifying attention are intensified when it comes to accumulating attention. Attention is always constituted and reconstituted in the present. Trending topics and memes have broken the old fifteen minutes of fame down to the micro-second. There are ways to hold attention but they must be constantly reconstituted. It is for this reason that Citton suggests that attention is best understood in terms of constituent asymmetries, asymmetries between who pays attention to whom. These asymmetries reterritorialize verticality in the midst of horizontal platforms of social media--something that can be seen in every sidebar of "trending topics." As Citton argued in his book on mythocracy, attention manifests itself in a softer form of power, one that shapes individuals as active participants. Whereas the old media maintained attention by its monopoly, three channels to watch etc., new media must constantly solicit us as subjects of attention. We actively create our own distractions. Attention cannot made to function like labor, it cannot be the source of value. This is not to say that attention is without its economic effects. The standardization of attention, its abstraction and measure, on one hand, and the battle over what one pays attention to, on the other, are central struggles to extract wealth from the flows of attention. Two strategies of the "vectorial class"are to own the icons and images the attract attention as well as the platforms that measure and standardize it. With respect to the former, Disney's buying of Marvel and Star Wars is nothing other than a kind of primitive accumulation of attention, every superhero is a vast mine of nostalgia; while facebook and Google's attempt to insert themselves as the interface for everything from research an essay to sharing pictures of grandkids can be considered the real subsumption of attention. As with Marx's real subsumption of capital, such institutions do not just effect the form of attention, focusing as its medium, but transform its very relations. The "like" button compresses so many responses, love, friendship, support, into an easily quantifiable data point. Citton's ecology of attention is constructed around a broader set of concerns regarding activity and passivity in attention. As Citton argues the question is how to make attention not how to pay it. How to construct the possible conditions that make our attention our activity rather than the passive construction of the effects of others? The question is ultimately more spinozist, it is a question of constructing common notions against the singular points of wonder and fascination. As Citton argues, work, entertainment, and social life converge in a state of constant semi-attentiveness. Updates and alerts define our work life, social life, and define what remains of politics. Transforming this constant distraction requires the cultivation of new habits and the transformative use of the existing technologies of attention. Citton is right to suggest that new practices of attention, of thought and action, are the necessary condition for different politics and ethics. However, there is a bit of an overlap between such an ecology of attentions and other "ecological" oriented projects that seek to disconnect and transform our relation to time, technology, and social relations, without directly transforming capital or the state. I am thinking of various forms of local food movements and even slow food. Such projects are necessary but risk being, at best, rearguard actions, defending in retreat, or, at worst, lifestyle choices. Just as the very transformation of attention is an effect of the the transformation of work, consumption, and the media, its revolution, or ecological salvation, will necessarily transform those structures as well.